What steps should i take next or to adjust and alter my current routine? Do you know if the Aveda product has silicones? I'm not familiar with that one, but Aveda in general isn't CG friendly. If you're no-pooing, that won't remove silicones in your hair. You probably need a hard hold gel instead of a curl enhancer. 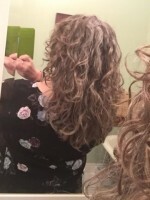 It'll dry crunchy, which nobody likes, but after it's dry you can scrunch your hair until it's nice and soft, and then it should hold your curls through the day and even into following days. Here's and article that was posted on plopping with a tshirt! It doesn't work for everyone but its definitely worth a try! Ooh I'm not too sure about using a gel but I agree with you that it wrong hold my curls longer. I'll try and see if that helps. I know the quats mean something but it's going off the top of my head at the moment. Thanks for your help! I'll try to see and utilize your suggestions. Hopefully, I can update this thread with results. Do you have any recommendations on gels too, btw? Phenyl Trimethicone is a silicone. Silicones aren't necessarily bad, but they require the use of a sulfate shampoo to remove, and sulfates are drying. So do one more shampoo with a regular shampoo, then stop using the Aveda product. You can find LA Looks Sports Gel (the blue one) almost anywhere (in the US), and it's super cheap, so if it doesn't work you're not out a lot of money. Thank you! It's been a long time coming lol you're right, it really is about trial and error. I think all my products are silicone free. I use carols daughter and Shea moisturie mostly. The aveda product I'm going to look into more. I tried putting my hair into the turbie twist as you suggested but I don't think I was doing it wrong then I tried plopping with a T-shirt but ended up taking that out too. I just let it air drythen. Thanks for your help! And sorry for replying so late.